The belief that the Earth is flat still lingers on the fringes of society. Kurtis Baute is looking to put that notion to rest. 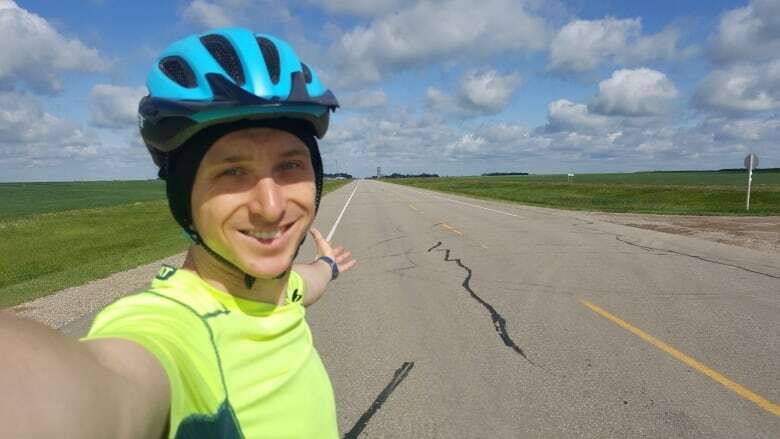 Baute is planning to calculate the circumference of the Earth by cycling to Stoughton from Regina, along Highway 33 — one of the longest straightaway stretches in the world. "Since the world is round, the shadows should be different sizes and the difference in those sizes will allow us to calculate exactly how big the Earth is," Baute told CBC Radio's The Morning Edition on Wednesday. Baute, a science educator from Vancouver, flew in from the west coast Tuesday to get ready for the hours-long bike ride. The whole thing is being done for Baute's YouTube channel. Although the Earth was measured more than 2,000 years ago by Eratosthenes, Baute said it's important to shed some light on science for people today who may doubt it. The plan is to set up one sundial Regina and another in Stoughton. On Thursday, measurements of the length of the shadows at both sun dials will be taken at the exact same time. Baute said if the Earth is indeed flat, the shadows should be identical and not at all varied. The trip to Stoughton is ideal, due to its general flatness. To prove the Earth is round, you gotta go some place flat, Baute said. The trek comes a month before Flat Earthers from around the globe gather in Edmonton for the Flat Earth International Conference. "I'm not doing this to pull the wool over anyone's eyes. I'm doing this to open their perspectives a bit," Baute said.